Sometimes I feel like I cannot stay in one place. My itchy travel feet always bring me somewhere. When am not out of my town exploring, I find myself trying little adventures here and there. A coffee lover, I like visiting new coffee shops, especially those that promote local coffee. I pass by Books and Beans pretty frequently but never really went. Yesterday, I claimed my phone from a repair shop and had plenty of time left before going to work. I decided to buy a new book to read, get myself a caffeine fix for the day, and give me self some cozy time! 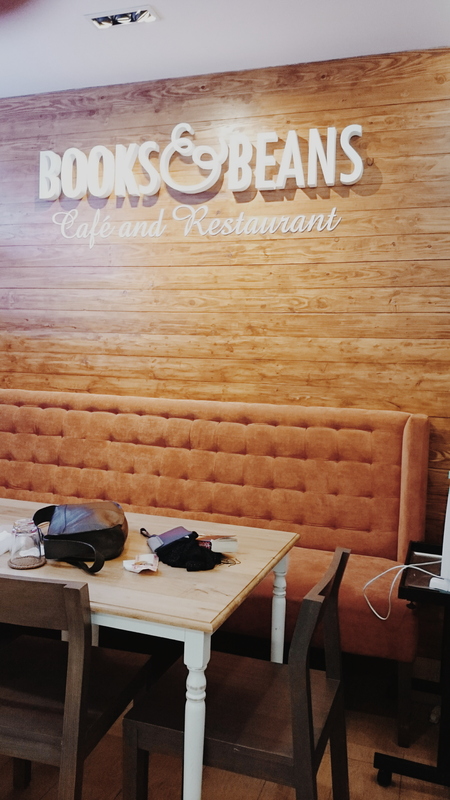 Am not sure how long Books and Beans Cafe and Restaurant has been. Maybe since late last year. But it was only recently that I got to see their cool signage outside Quad Alpha Centrum Building. The shop does not have an exclusive space. 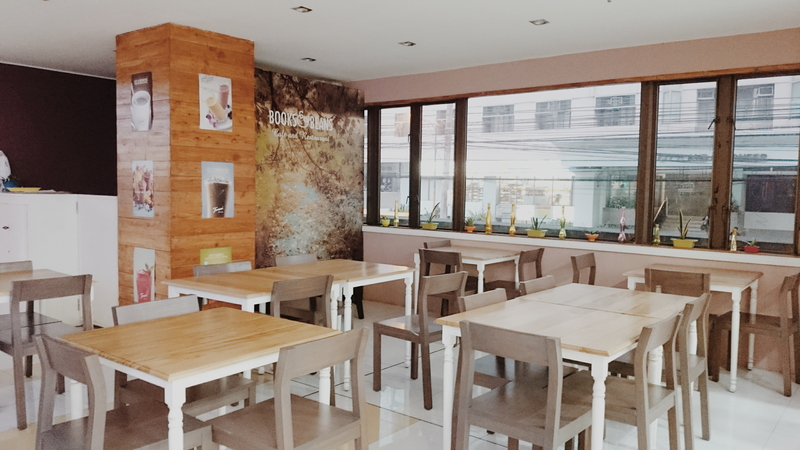 They occupy an open space leading to a National Bookstore branch on the side. 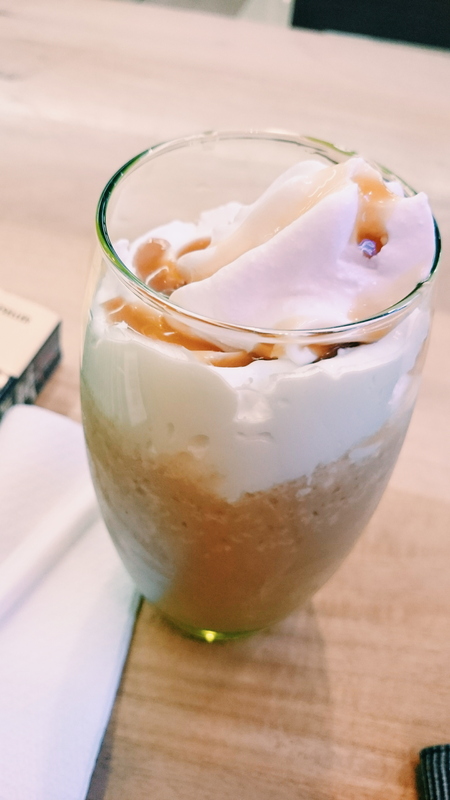 At first, you’d associate it with NBS – like buy a book and get a cup and chill. But they are not in partnership according to the lady who served my drink. That spot right there gives you a good view of what’s around you. Your view from the cozy sit. For writers or bloggers who get more brewing inspiration writing while watching people from all walks of life pass by (like myself), this is a good spot. I did not check if they have Wifi but this spot let’s you plug a laptop. Got myself a Caramel Almond for Php140.00. I originally ordered and paid for a Salted Caramel fix but since I came towards their closing time, supply was no longer enough. The lady who had served me my drink politely explained the situation so I did not really mind switching. The cafe is open from 9AM to 6PM. They also serve breakfast, lunch, and dinner. Their page says they also deliver. They also serve breakfast, lunch, and dinner. If you are looking for books, there’s not many. But you can grab from a few they have on display and their book-themed wallpapers add to the feel. 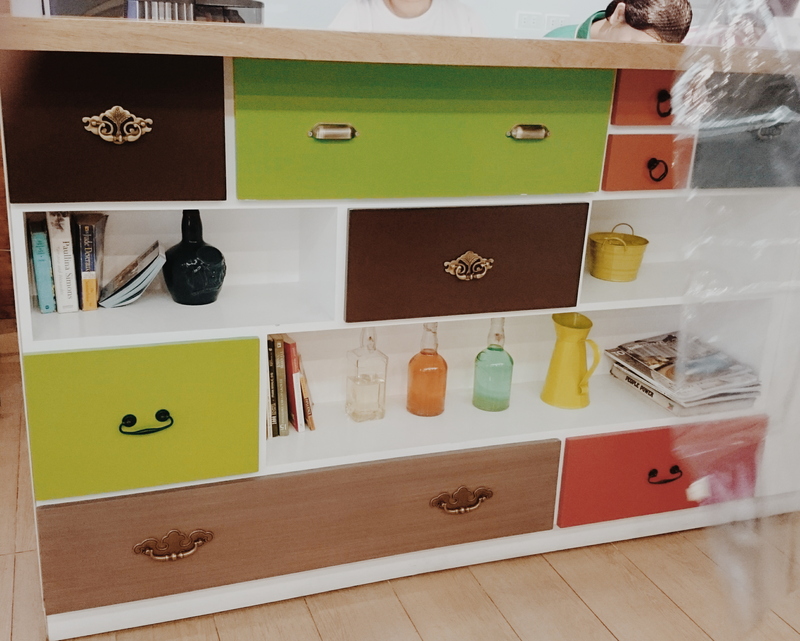 Not sure if those drawers have books in them. I will check next time or maybe you can and update me. 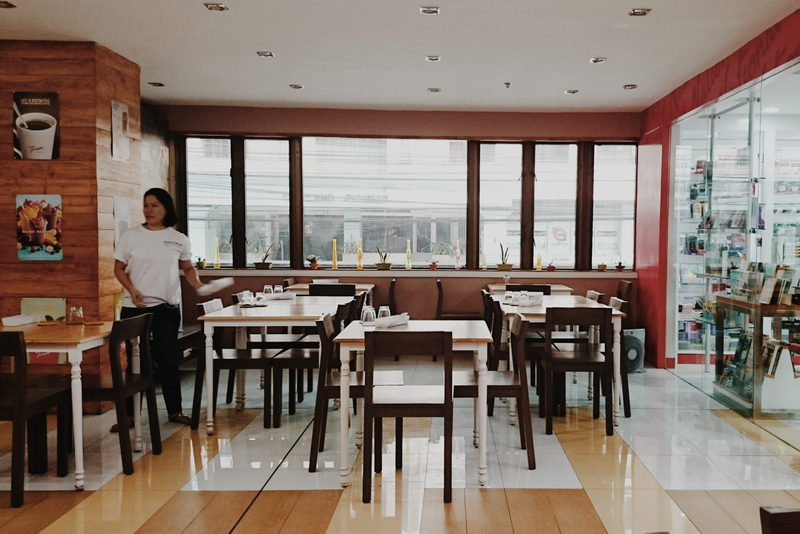 Plus hey, NBS is a few steps away. Feel free to buy something to read. I saw a book on Mythology. Another small adventure to keep me where I am. At least close to where I am. Join me on my next cheap thrill! 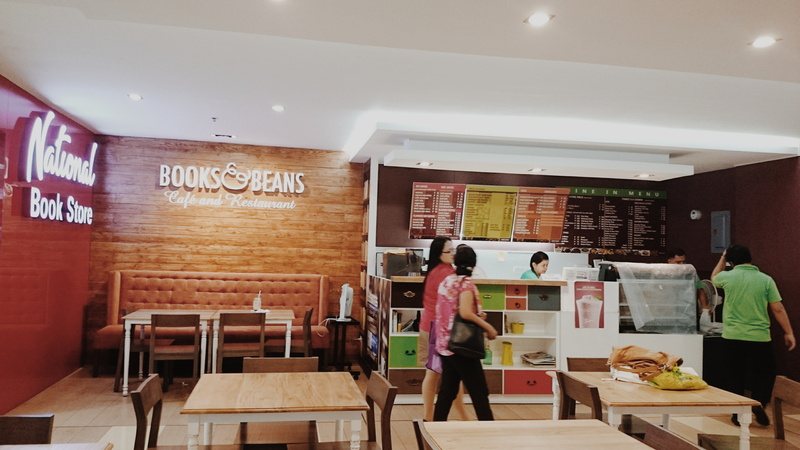 Books and Beans Cafe and Restaurant is located at the Ground Floor of Quad Alpha Centrum 125 Pioneer St. Mandaluyong City. Am still reaching out to the owner for more details but have not received a response yet. Stay tuned!